Recent release “Share the Sky” from Page Publishing author Regina Mirra is a captivating account about the stars, the sun, and the moon, and their connections with each other. 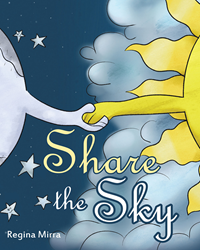 Regina Mirra, an aspiring children’s book author, a mother of a very inquisitive son, and a gifted storyteller, has completed her new book “Share the Sky”: an enchanting story featuring the enigmatic nature of heavenly bodies. Published by New York City-based Page Publishing, Regina Mirra’s alluring narrative is an exemplary tool in explaining certain phenomena to very curious children, and guides them in imagining scenes of terrific and epic moments that explain how the universe astoundingly works. But there's more than meets the eye in Share the Sky -- it has an important purpose and underlying message for children. It's not just an entertaining tale but also a story that can help alleviate childhood anxieties (fear of storms/lightning/thunder/the dark) at a time when some young children typically struggle with these happenings, while reinforcing the concept of sharing (at a time that is crucial in child development). Readers who wish to experience this beguiling work can purchase “Share the Sky” at bookstores everywhere, or online at the Apple iTunes store, Amazon, Kobo, Google Play, or Barnes and Noble.